Klaxon radio: If you are north of the Rohan forest, to the Datchacha, there is a a special unit of cop dressed in light blue who ambush people and make surprise arrests. So watch out, do not stay alone! 09:00am Solidarity protests in Rennes scheduled for 18:00 (06:00pm) at Sainte-Anne tonight. As we reported earlier there will also be solidarity protests in Paris: RDV 18:00 (06:00pm) at belleville. 08:42am A digger arrived at the La Saulce crossing. 08:05am The cops are positioned at the côté du Moulin, la Pruche, all around the Châteigne, on the chemin de Suez east of La Riotière, and now surround a large area. 08:04am Barricade on fire at the Chemin de Suez. Tonight: Solidarity protests against the expulsions at La Zad: in Paris: RDV 18:00 (06:00pm) at belleville. 07:51am The goal of the cops is to evict 10 projects at La ZAD today (at least that is what they say). Nothing destroyed yet. 07:43am The cops are also at l’ambazada. They are positioning at the complete east part of the chemin de Suez. 07:36am Confrontations at the La Saulce crossing continue. 07:33am Regular blasts now at la Chateigne. The cops want revenge for their defeat in 2012 and attack the symbol of the victory over operation Ceasar. 07:30am Burning barricade at La Saulce. 07:19am Cops started an attack against Châteigne. 07:11am Cops at the edge of the forest of Rohanne, on different points. They are positioned north of the Maquis and announce the first summons. 07:04am Cops prepare expulsions at Rohanne Forest. 07:02am There is an info point at Bellevue. 06:46am The cops threaten to attack Bellevue when people defend the Rohanne forest. 06:24am zad.nadir.org report that General Lizuray, who is in charge of operations has just shown the map of the places the cops targeted for today: the Vosgerie, the Châteigne, Puiplus, and cabins in the Rohanne forest. He said that places that have submitted projects, agricultural or not, will not be evicted. Nothing is known about the number of days the intervention will last. We oppose any expulsion! 06:02am About thirty vehicles are on the D81 at the level of la Vacherit, part of them went to the La Saulce crossing. People lay down on the road just north of la Rolandière to slow their progress. 05:56am 15 vans with came to the barricade of Liminbut, summons, barricade on fire and tear gas. 05:27am We are also told dozens of GM vans heading to Ardillières from Fay at 5:20. 04:57am There are now at least 70 vans from the school in the direction of Vigneux, plus 4 jeeps and 3 cars including a station wagon. 04:46am Alert! 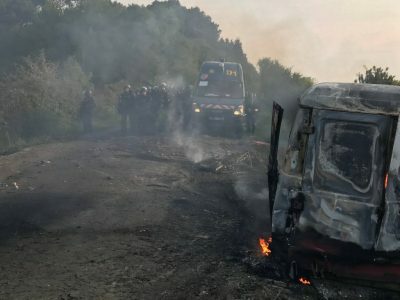 The vehicles of the gendarmes approach the zad: since 3:30 the vans and cars joined in mass (at least more than 70 vehicles) at the dchool , where the cops who operate at La ZAD are parked. Since 4:20 at least fifteen vehicles have arrived in Vigneux, at least a portion of which have forked in the direction of Paquelais. The helicopter is just starting to fly over the zad center. There is fear of targeted actions, or a start of deployment for searches (which can only be done from 6am).